Once the very embodiment of Silicon Valley venture capital, the storied firm has suffered a two-decade losing streak. It missed the era’s hottest companies, took a disastrous detour into renewable energy, and failed to groom its next-generation leadership. Can it ever regain the old Kleiner magic? Some five years ago Vladimir Tenev and Baiju Bhatt, founders of a potentially disruptive no-fee stock brokerage startup called Robinhood, set out to raise capital for their fledgling Silicon Valley outfit. They sought a relatively small amount, $13 million, that would value their idea at $61 million. The former Stanford classmates, both within spitting distance of their 30th birthdays at the time, did what entrepreneurs have been doing for decades: They asked the venerable venture capital firm Kleiner Perkins Caufield & Byers to back them. Kleiner—its singular name is as sufficient on Sand Hill Road as Oprah is in Hollywood—was interested. The firm sees lots of opportunities, however, and it chose not to bite. Then, in mid-2015, when Robinhood was looking for another $50 million at a valuation of $250 million, Kleiner passed again. By 2017, when Robinhood became a “unicorn” valued at $1.3 billion as it raised an additional $110 million, it was the startup doing the snubbing: It excluded Kleiner from the list of venture firms that participated in its funding. It wasn’t until early last year that Robinhood and Kleiner finally connected, according to accounts from dealmakers on both sides. By then Robinhood had made such a splash in the brokerage world that Fidelity, TD Ameritrade, and Charles Schwab had cut fees in response to the upstart’s zero-commission offering. Under the sponsorship of famed Wall Street analyst Mary Meeker, a Kleiner partner since 2011, the firm that had failed repeatedly to invest at increasing levels now participated in the $363 million funding round, valuing Robinhood at $5.6 billion. The inability to get in on a hot startup’s ground floor, only to subsequently pay a far richer price, was all too common for the once-storied firm. Kleiner had sat out on another generation of technology investments, the crop of so-called Web 2.0 companies, including Facebook in the 2000s. Now, in the 2010s, it was failing again to make early-stage investments—the traditional meat of venture capital investing—in the most sought-after startups of the day. But this time its whiffs came with a perverse twist: Kleiner was succeeding wildly with a new strategy centered around Meeker, who ran a separate fund within the firm focused on more mature private companies that required capital to grow as opposed to merely establish themselves. “Growth” investing, with its more developed companies, should be somewhat safer than “venture” investing and would also earn commensurately lower returns. Yet Meeker’s investment team outperformed the venture group overseen by longtime Kleiner leader John Doerr and a rotating ensemble of lesser-known investors who joined and left him over the years. Meeker, not the venture capital investing unit, was landing stakes in the era’s most promising companies, including Slack, DocuSign, Spotify, and Uber, breeding resentment over tension points as old as the investing business: Who gets the credit and, more important, who gets paid. What happened next is another age-old tale in the business world, of how a once-proud stalwart found itself on the edge of irrelevance. It’s about just how much succession planning matters and the ramifications of not adequately grooming the right successors. And it’s a reminder that something as elusive as identifying early-stage winners from the pack of wannabes doesn’t get easier, even after more than four decades of practice. The story of what happened in the past handful of years at Kleiner is also one neither the firm’s partners nor the notoriously tight-lipped VC industry around it are interested in discussing, at least on the record. Doerr, Meeker, and other Kleiner principals all declined to be interviewed for this article or to comment. But more than 20 current and former employees, investors in Kleiner’s funds, entrepreneurs, and other industry observers did talk about what went wrong and how, if possible, the firm can ever regain that old Kleiner magic. Way back in 2008 we posted "What the hell happened to Kleiner Perkins? (John Doerr et al [Gore])"
Following up on "Kleiner Perkins founder says Silicon Valley elite are being treated like Jews in Nazi Germany". "Warren Buffett Sees Most Newspapers as ‘Toast’ After Ad Decline"
“The world has changed hugely,” Buffett said in the interview with Yahoo Finance, which will serve as the livestream host for Berkshire’s shareholder meeting. The bleak outlook echoes Buffett’s remarks at last year’s annual meeting, when he lamented the state of the newspaper industry. Berkshire’s BH Media, which owns papers across the country, has been cutting jobs to cope with declining advertising revenue. And it will be decades before self-driving cars are all over the roads, John Krafcik says. It'll be decades before autonomous cars are widespread on the roads -- and even then, they won't be able to drive themselves in certain conditions, the chief executive of Waymo said Tuesday. John Krafcik, head of the self-driving car unit of Google parent company Alphabet, said that though driverless cars are "truly here," they aren't ubiquitous yet. And he doesn't think the industry will ever be able to drive at any time of year in any weather and any condition, the highest driving rating. Driving in all conditions can be difficult for humans too, he noted. "It's really, really hard," Krafcik said. "You don't know what you don't know until you're actually in there and trying to do things." "Worst-Case Wednesday: How to Open a Bottle of Wine with a Broken Cork"
Going down market into the barley based tastes? Here's "Worst-Case Wednesday: How To Keep Beverages Cool In The Desert"
"Andreessen Horowitz Is Blowing Up The Venture Capital Model (Again)"
Saudi Arabia on Tuesday beheaded 37 of its citizens, including crucifying one, alleging that they participated in crimes related to terrorism. The body and severed head of one person killed in the mass execution was pinned to a pole as a warning to other people, The Associated Press reported. Saudi Arabia's King Salman approved the beheadings in a royal decree. The Interior Ministry said those who were killed had extremist ideologies and had created terrorist cells, the AP reported. It also said the prisoners were found guilty and ordered killed by a court specializing in terrorism trials as well as by Saudi Arabia's high court. And in the U.S., one of the perps in the 1998 dragging death of James Byrd, Jr. is scheduled to die today. I was righteously discomfited* when the Financial Times' Paul Murphy frontran our plans to revisit the BBC's look at the Ticino spaghetti harvest, fearing that everyone who reads both FT Alphaville and Climateer Investing would assume, because he hit publish first, that we were uncreatively ripping-off ideas, unattributed. However, recent life events (this morning's Markets Live) have convinced me to reconsider that position. In today's installment, Mr. Murphy retakes his perch at ML. BE So .... there are many things we can talk about today, and some we can't talk about. BE Or I can't, at least. BE Aha ........... It's Paul Investigations Editor Murphy. BE Yes, I figured that might be the reason you're here. BE Wirecard up 6% or so on the news. Capital Markets: "Dollar Bloc in Focus, while Germany's IFO Disappoints"
Overview: The record high close for the S&P 500 failed to lift global equities. Far East trading was mixed. The Nikkei opened strong and closed weaker, while the Shanghai Composite began softer and closed firmly. Australian shares and bonds rallied on the back of mild inflation, while the Australian dollar tumbled. Oil in easing for the first time in four-sessions and this is weighing on benchmark 10-year yields were are one-two basis points lower. Europe's Dow Jones Stoxx 600 has an eight-day rally on the line. It has only retreated in three sessions this month. It is slightly lower today past the midway point in today's local session. The US dollar is firm against most of the majors and nearly all the emerging market currencies but the Chinese yuan. The dollar is near the highs for the year against the Turkish lira (~TRY5.88) and is near the highs for the month against the South African rand (~ZAR14.35). The Australian dollar is the weakest of the majors, off around 0.8%, while the yen and Swiss franc are steady to slightly higher. Disappointment with the German IFO survey kept the euro on the defensive, while sterling is near two-month lows. Soft Australian inflation data boosted the likelihood of a rate cut and sent the Australian dollar below $0.7030 to its lowest level since mid-March. Consumer prices were unchanged in Q1. The median forecast in the Bloomberg survey was 0.2% after a 0.5% gain in Q4 18. This translate to a 1.3% year-over-year pace, down from 1.8%. The underlying measures softened as well. Australia's two-year yield tumbled 15 basis points to 1.30%. The cash rate sits at 1.5%. The pendulum of market expectations has swung from around a 1 in 9 chance of cut next month at the end of last week to better than even money now. "Russia is building a new Arctic. With private money"
Following up on Monday's "Russia seeks Chinese support in developing Arctic shipping routes, promising long-term gas supplies in return". «We have discussed a new system of investment preferences,» Russian Deputy Prime Minister Igor Trutnev made clear to the press after last week’s meeting in the Arctic Commission, the governmental body for Arctic developments. According to the top government official, companies that invest in the Arctic could get their tax burden reduced with as much two thirds for the whole project period. «We are looking at two alternative approaches: One with up to 15 years long tax preferences that include zero tax rates on profits and property, land use and extraction, and a second with 2/3 tax reductions for the whole project period,» Trutnev said in the press briefing. It is the second option that is the most interesting both for government and the companies, he made clear. "Qatar Launches Massive LNG Shipbuilding Program That Could Exceed 100 Ships"
The global fleet was around 525 LNG carriers at year-end 2018. Qatar, the world’s second largest exporter of liquified natural gas, has taken its first firm steps in a massive LNG shipbuilding program that could exceed 100 newbuild LNG carriers over the next decade. Qatar Petroleum on Tuesday issued an ‘invitation to tender’ to shipbuilders for the reservation of LNG ship construction capacity. The initial plan calls for the construction of 60 LNG carriers with the potential to exceed more than 100 ships over the next decade, according to Qatar Petroleum. Qatargas will execute shipbuilding program on behalf of Qatar Petroleum. Is that Marshal Mannerheim in the tree on the right? I'm still waiting for SoftBank to hit a cash crunch big enough to force the re-listing of ARM. Billionaire Masayoshi Son reportedly made a massive bet on bitcoin near the peak of the digital currency’s frenze in 2017. The founder of Japanese conglomerate SoftBank personally lost over $130 million when he sold his position, the Wall Street Journal reported on Tuesday. Son has a reputation for making big, risky bets but has had a successful track record with many such investments. Japanese billionaire Masayoshi Son, the founder of conglomerate SoftBank, personally lost over $130 million when he sold his position in bitcoin, the Wall Street Journal reported on Tuesday. Son made the investment in late 2017 the report said, near the digital currency’s record high near $20,000 in December of that year. Bitcoin has traded around $5,000 in recent weeks. While it is unknown exactly how much bitcoin Son bought, he sold early last year after the speculative digital currency’s value collapsed. Investment bank Morgan Stanley on Monday raised its price target on Xilinx stock ahead of the highflying chipmaker's quarterly earnings report this week. Morgan Stanley analyst Joseph Moore reiterated his overweight rating on Xilinx (XLNX), but raised his price target to 137 from 101. Xilinx stock dipped 0.4% to 134.44 on the stock market today. It broke out of a seven-week consolidation period at a buy point of 95.28 on Jan. 24. Watch Out NVIDIA: "Amazon, Huawei efforts show move to AI-centric chips continues"
A Dip Into Chips: "AI Chip Architectures Race To The Edge"
"Why Alibaba is betting big on AI chips and quantum computing"
Chips: "A Rogues Gallery of Post-Moore’s Law Options"
El Niño "conditions" begin at a half-degree above the zero line while a full blown El Niño is declared after three rolling three month periods (five consecutive months) above +0.5°C. 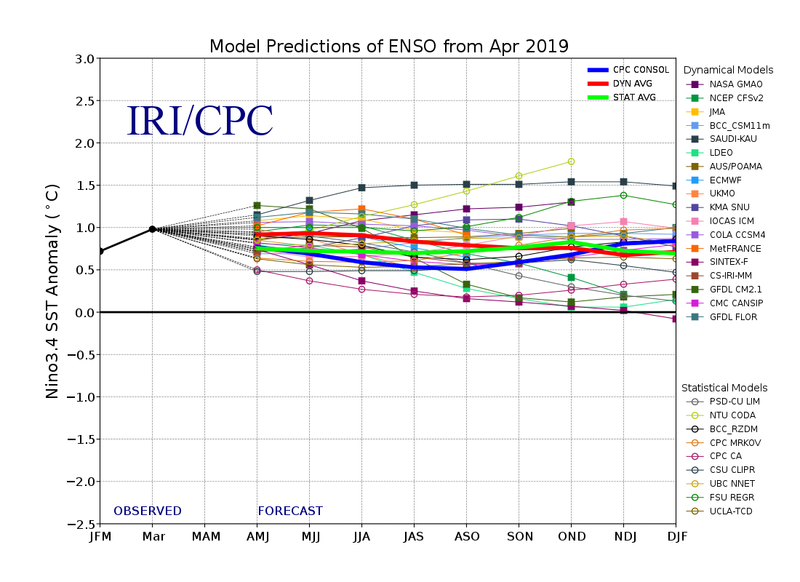 Besides all its other effects, during the hurricane season El Niño tends to produce wind shear in the North Atlantic which in turn tends to inhibit development of hurricanes which tends to reduce the number of storms and to a lesser extent their severity. It's not a lock but is the direction to shade the bet. It's been a while since we visited Artemis but with the official start of the Atlantic hurricane season less than six weeks away we'll be stopping by more often, starting today with a look at the industry's changing capital structure. Alternative reinsurance capital’s continued growth through 2018, as well as the slight shrinking of traditional reinsurer capital have been confirmed in a report out today, while at the same time profits at reinsurers are seen to have shrunk again, based on underlying returns on equity (ROE’s). Total dedicated global reinsurance sector capital was measured at $462 billion at the end of 2018, according to Willis Re’s latest report. Shareholder equity of the 32 reinsurance companies tracked in the firms Willis Reinsurance Index fell by 10% to $335.7 billion, a reversal from the growth of 8% seen in 2017. But alternative reinsurance capital, so that employed by insurance-linked securities (ILS) funds, collateralized reinsurers and other capital markets backed structures, expanded by 6% to reach $93 billion at the end of 2018. It’s interesting to see that by Willis Re’s measure, the compound growth rate of traditional reinsurance capital has actually been a slow decline since 2014, at -1%. Where as, alternative reinsurance capital has achieved compound annual growth of an impressive 9% across the five-year period. The main reasons that traditional capital shrank in 2018 were mergers and acquisitions (M&A) related shrinkage, largely the exits of Validus and XL Catlin as independent companies, as well as dividends and capital returns, plus unrealised investment depreciation, the broker explained. The data confirms the growing importance of ILS and alternative capital in global reinsurance, as despite the expansion of major reinsurers, who continually grow their platforms and diversify into primary lines or other areas of risk, the overall capital they contribute between them has actually been shrinking across the five years since 2014. This does imply rising expenses without rising capital bases for many in the sector, something that is perhaps reflected in Willis Re’s measure of return on equity (ROE) for a subset of the Reinsurance Index it tracks. "You Always Speak of Luddites But What of Captain Swing?" "Between the summer of 1830 and the summer of 1832, riots swept through the English countryside. 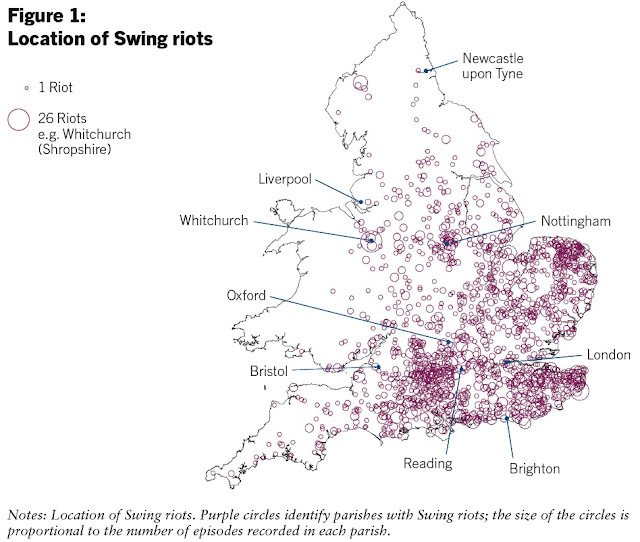 Over no more than two years, 3,000 riots broke out – by far the largest case of popular unrest in England since 1700. During the riots, rural laborers burned down farmhouses, expelled overseers of the poor and sent threatening letters to landlords and farmers signed by the mythical character known as Captain Swing. Most of all, workers attacked and destroyed threshing machines." "Threshing machines were used to thresh grain, especially wheat. Until the end of the 1700s, threshing grain was done manually and it was the principal form of employment in the countryside during the winter months. Starting from the Napoleonic Wars (1803-1815), threshing machines spread across England, replacing workers. Horse-driven or water-powered threshers could finish in a matter of weeks a task that would have normally kept workers busy for months. Their use arguably depressed the wages of rural workers." General Ludd, and the army of redressers that gathered behind his name, has become something of an all-purpose avatar for any attitude towards technology that is less than fawning. Whether this image of the Luddites is based upon historical evidence or simply upon hysterical paranoia is another matter, though one thing that is certain is that the specter of General Ludd still haunts technological society. Given the frequency with which Ludd’s name is evoked – be it as an epithet or as a source of inspiration (see: Neo-Luddism) – one could be forgiven for assuming that the Luddites were the first, last, or at the very least largest group to have seen machinery as a symbol of both their actual and figurative immiseration and to have acted accordingly. Yet such a belief would be incorrect. While General Ludd may haunt the subconscious of technology’s loudest advocates, and while the Luddites may be remembered primarily for their machine-breaking tactics, Ludd’s followers did not originate the tactic of machine-breaking, and similarly they were not the last group to make effective use of the strategy. Indeed, if one is interested in the history of machine-breaking than General Ludd is not the only myth enrobed leader worth knowing about. For there was also Captain Swing. A short historical sketch is necessary before comparisons can be made – for, though there are certainly similarities between Ludd and Swing, there are also important differences. The followers of Captain Swing are those who participated in what came to be known as the “Swing Riots,” which raged across numerous counties in England from the later part of 1830 into the early months of 1831. By the late August of 1830 the agricultural workers of England had been squeezed to the point of destitution by a combination of economic policies, overabundance of available laborers, the enclosure of the commons (which had previously allowed many to eke out a frail living), dwindling wages, new restrictive Poor Laws, and the increased usage of threshing-machines that resulted in ever fewer laborers being hired (a particular problem in the winter). Modern industrial capitalism was rearing its head and as it surveyed the world it would claim as its birthright it ignored the workers and their traditions – the agricultural laborers may have already been impoverished but conditions were now such that survival itself had become precarious. Amidst the backdrop of political turmoil at home and with the example of revolution across the channel the situation was primed for upheaval, and once it came it easily spread. and "'Smart Condom' Tracks Thrust Speed and Velocity and Lets you Share the Data"
As for Hobsbawm, he usually graces our pages in reference to his review of Luttwak's "Coup d'État: A Practical Handbook." His last appearance was in "There Has Obviously Been A Coup d'Etat at FT Alphaville (TSLA)". "Russia seeks Chinese support in developing Arctic shipping routes, promising long-term gas supplies in return"
It appears the stories of a cash crunch for projects in the Russian far north were accurate. Russia wants to team up with China to build an Arctic shipping route, its ambassador to Beijing has said. Moscow recently set out an ambitious programme to build new ports and other infrastructure facilities to increase cargo shipments across the Arctic, also known as the Northern Sea Route. Russian ambassador Andrey Denisov told the South China Morning Post that negotiations over the supply of Russian gas to China through a route known as Power of Siberia Two were at an advanced stage. Denisov said the two sides were accelerating the pace of the negotiations and he was optimistic they would reach a deal. “China as a buyer needs gas and a reliable long-term source. Russia is definitely that kind of source,” he said. Work on Power of Siberia One, also known as the “Eastern Route”, is expected to finish on December 10 and is expected to transfer 38 billion cubic meters of gas to China every year. Any deal concerning Power of Siberia 2, or the “Western Route”, could further strengthen the energy alliance between China and Russia. In recent years the countries that border the Arctic have become increasingly assertive about their territorial claims, as melting polar ice opens up the prospect of increased shipping and access to valuable natural resources. "Saudi Arabia Looks to Enter Arctic LNG With Large Investment"
"New state commission takes on Putin’s big plan for the Arctic"
"It’s an order from the Kremlin: shipping on Northern Sea Route to reach 80 million tons by 2024"
"Unicorns, IPOs and the hidden links among the new wave of tech giants"
The news sends GeekWire co-founder John Cook and and me on a startup odyssey on this episode of the GeekWire Podcast, exploring the hidden connections among the new wave of public companies and tech behemoths in Silicon Valley and Seattle, including Uber, Lyft, and Convoy. Here’s the thread of the conversation if you want to follow along. One of the most interesting aspects of the Outreach funding is that it was led by Lone Pine Capital, a relatively unknown hedge fund manager based in Greenwich, Conn. In November 2016 we headlined a post Artificial Intelligence: What Could Derail NVIDIA? A Lab in Shenzhen; A Basement in Moscow; An Office in Bristol (NVDA). Graphcore was the "Office in Bristol". GPUs are widely used to accelerate AI computing, but are the limitations of GPU technology slowing down innovation in the development of neural networks? In a recent interview with EETimes (Graphcore CEO Touts 'Most Complex Processor' Ever), Nigel Toon, CEO of Graphcore, explained that while GPUs are good at running convolutional neural networks (CNNs), they are not suitable for running the more complex types of neural network needed for reinforcement learning and other futuristic techniques. “A GPU is a pretty good solution — if all you’re doing is basic, feed-forward CNNs. The problem comes when you start to have more complex neural networks. Rather than just doing it a layer at a time, I want to be able to go through some layers then feed back, and I want to be able to store information on the side which I can use as context information as I look at the next data. And if my data is changing — so, rather than it being millions of static images that I can feed in in parallel — if it's video and I'm interested in sequential frames, it's much harder to feed that in in parallel and take advantage of the wide SIMD paths in a GPU,” he said. As part of our longer conversation, Toon noted that Graphcore has captured the interest of such AI visionaries as Demis Hassabis, a founder of DeepMind, and the founders of OpenAI, including Ilya Sutskever, along with many other leading researchers in machine learning. Graphcore worked with these researchers to design the IPU architecture based on the kinds of problems that they want to solve. Toon points to the development of ASIC-type accelerators that are built to accelerate specific neural networks, as well as increased interest in FPGA solutions for AI, as proof that GPUs can’t do the job well enough. There is a need, he says, for an easy-to-use processor that is designed from the ground up, specifically for machine intelligence. If you follow the link there are three references to the entire interview. If you don't follow the link here's "Graphcore CEO Touts 'Most Complex Processor' Ever". A deep dive into what is fast becoming a serious problem. The ASF virus, endemic to Africa, is fatal to pigs and has no cure. The current wave of cases began in Georgia in 2007 and spread to parts of eastern Europe and Russia before reaching China in August. After eight months of Beijing claiming the situation was under control, the crisis has now become undeniable. The Ministry of Agriculture said last week that a preliminary estimate forecasts pork prices to rise more than 70 per cent year on year in the second half of 2019. "Reputational currency, like China's Social Credit Score, rebrands repression as rational nudging. And these algorithmic governance models are spreading"
The most successful Internet companies, it seems, all learned the lesson of Tom Sawyer. By outsourcing labor to their users, it is as if they have cordially invited friends and neighbors to delight in painting their fence. Instagram does not need to hire photographers; users snap, post, and comment on photos, and their hashtags are a filing system, a taxonomy as meticulously curated as a filing cabinet. Instagram’s parent company, Facebook, relies on all of us to keep each other amused, as does the Chinese platform Weibo. Even Google, Amazon, and Alibaba, operating far afield from social media, rely on combined consumers and producers (“prosumers”) to let them know when their algorithms are helpful. Every society depends on free labor—work that is vital but which goes unpaid. They also allow customers to police the quality of products and websites so that they don’t have to pay someone to do that work. Airbnb, Uber, and eBay apply similar methods, shifting the burden of quality control by having both sides in commercial transactions rate one another. We all give up small treasures—our data—to paint the fence of platform capitalists. There are standard solutions to such problems. Courts can drain the bank accounts of “deadbeat dads.” Churches and civil society groups can stigmatize deviants, and the carceral state can further scare scofflaws. But these approaches take resources. The perfectly efficient neoliberal state would cut out the middleman. It would learn from Silicon Valley that you can motivate people not only to rate and rank one another, but also to positively enjoy the power and responsibility that rating (and being rated) entails. The Chinese government is now implementing just such a system at the national level. Called the Chinese Social Credit System (SCS), it has some familiar foundations. Its early iterations (pioneered by private firms) allow users to share images of their scores with one another. As with financial credit scores used by many lenders, the system rewards people for repaying debts promptly. But the SCS does not stop with credit; it factors in court judgments, criminal records, academic dishonesty, jaywalking, moving violations, and failing to pay transit fares. criminal records, academic dishonesty, jaywalking, and more. How can a government judge the relative value of working in the market versus visiting a lonely aunt? For the architects of the SCS, these spheres diverge: cash rules commerce, and a new currency will govern culture. That currency is reputation, a single score to express a person’s social value. As China’s SCS approaches its full implementation around 2020, the scoring of activities will spread, assigning points for a wider range of antisocial and social behaviors. Eventually China may make a Great Leap to Commensuration, in which every activity (or inactivity) is judged and converted to points, giving lived reality the feel of a never-ending video game. This is grim but true. According to the World Health Organization, the number of people who have diabetes surged from 108 million in 1980 to 422 million in 2014, while worldwide obesity has nearly tripled since 1975. Many public health experts link these trends to heightened global intakes of addictive and calorific sugary snacks and drinks. "Cities Are Rising in Influence and Power on the Global Stage"
A subject near and dear to our jaded hearts. It's the manifestation of the age-old thirst for power, to make the world as you want it, and an acknowledgement that fixing potholes is boring. The two global compacts were adopted in Marrakesh in 2018, prompting 150 mayors and city leaders to sign a second declaration calling for the full and formal recognition of the role of local authorities in the implementation, follow-up, and review of both compacts. The UN High Commissioner on Refugees enthusiastically embraced the city leaders’ declaration in a speech highlighting the necessity of working with city leaders to solve the global refugee crisis. It’s increasingly apparent that cities are no longer just places on the world atlas, or passive appendages of their state governments, but influential and independent actors in global politics. "An electrical meltdown looms: how can we avert disaster?" There is a determined push to decrease the importance of nation-states while elevating the worldwide political power of municipalities and their mayors, a trend I had assumed CityLab backed come hell-or-high-water. Trends to Watch: "Can mayors actually rule the world?" "It advises cities on what to do about problems that result from advice he gave them in his previous books..."
Yesterday two Alphavilleins, Izabella Kaminska on Twitter and Kadhim Shubber in the Further Reading post highlighted this Dani Rodrik essay at Aeon. Our most recent piece on what may or may not be a phenomena was last month's "Return of the City-State, Or: The End of the Nation State May Be Upon Us" which also linked to Aeon. Pope Francis Calls For "Rethinking of the figure and the role of the Nation-State..."
"Mayoral Powers in the Age of New Localism"
One of the problems with politics is that the people attracted to power are exactly the ones who should not be allowed anywhere near it. We've been watching the mission-creep trend in municipal governance for a while now, trying to get in front of it—"Il faut bien que je les suive, puisque je suis leur chef"*—to make a bucko or two but, to date, have only come up with the tautology that these people would rather jet off to Buenos Aires during the Northern Hemisphere winter for the Global Parliament of Mayors** than stay home and fix potholes. It was ever thus, or at least has been since 1967 when John Lennon noted "4000 holes in Blackburn, Lancashire"
*Ledru-Rollin, 1848—schoolboy French translation: "I must follow them for I am their leader." And many more, use the search blog box, top left if interested. And if you have the time and the inclination do take a look at that "Trends to Watch..." piece linked at the top of the previously posts. "Landlord 2.0: Tech’s New Rentier Capitalism"
"Will we survive the next financial crisis?" "Unlocking the Creative Value of Inefficiency"
"Could Rome have had an industrial revolution?" "AI’s Nemesis is Cloud Storage Economics"